Patterns for Resonant Space is ambient in sound, but experimental in design. 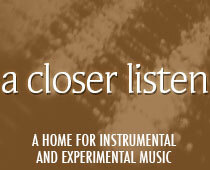 The album was composed in reverse fashion, with the piano offering comments on the field recordings and tape loops. The background becomes the foreground, yielding an appreciation of space and reverberation. To listen is to reevaluate the basis of music: is it sound or note? The crunchy textures make an excellent case for the former, rattling around from speaker to speaker, confident in their allure. Vocal fragments and water droplets populate “Melt Canyon”, in which the ivories seem almost an afterthought; the atmosphere is the attraction. Not until midway through the fourth track (“Patient Elegy for Bern’rd Hoffman”) does something resembling a song break through, as the piano pushes its way upfront and the wordless vocals insist on being heard. The contrast created by this piece benefits the album as a whole, making the former tracks seem like a tender prelude. After this, the abstraction begins to retreat, giving way to greater form. The “self-animating” lenticular cover is a metaphor for the music within. The image seems one thing until it is approached; then it grows elusive, resisting definition. Just as quickly as hints are given, they are taken away. The lovely “Music Box” pings and chimes, an apparent lullaby; but the inhabitants of this sonic world are not content to rest on their laurels. The trio allows room for allusive dialogue on Side B, a reminder of their filmic concerts. “Chopsticks, Motor, Lecture” sounds just like its title, with the piano chasing words around the sonic field like brooms chasing dust. A television tries to take control at the end of “£20,000” until the feed is abruptly cut. And closer “Leaves Like Photographs” offers a lovely image of leaves imprinted on leaves, but ends its primary segment in suspension: “I don’t know”. After this, there’s a hidden scene, like one in the movies, a soft coda that cushions the conclusion in rewind and warp, implying the abrasion of memory through the distortion of time.